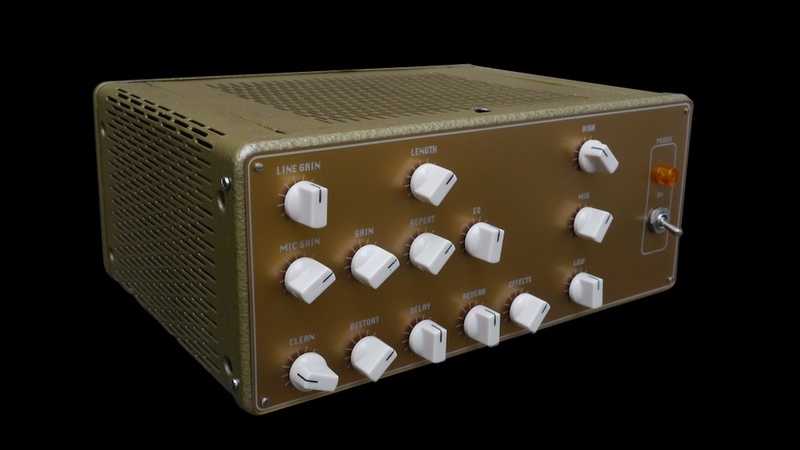 The Golden Beetle began its life long ago as an Echolette guitar amplifier. Unfortunately, when I received the chassis, both transformers were shot and heat damage to the PCB board made the unit irreparable. Of course, the next best option is always to repurpose the case and here it has become a vocal preamplifier. The first stage uses a pentode tube and 1:10 transformer to bring the signal to line level. From here it is mixed with an instrument input and sent in parallel to various outputs via a cathode follower. The parallel mixing allows the clean signal of the vocal to always stay true while adding distortion and reverb or delay. As well, there is an option to add external effects for extra options. From here the signals are brought together via the individual level controls and a virtual earth mixer which feeds the equalizer section. Finally, there is a paralleled ECC82 output section to drive the transformer for a low impedance balanced output.